Camping Dordogne - looking for a campsite? Seach here! Dordogne is part of the Aquitaine region of France and is thought by many people to be one of France’s best kept secrets. While the area boasts abundant natural beauty and rich history, the luxury camping sites in this part of the country don’t tend to be crowded as in other areas and holidaymakers are sure to find the luxury mobile home of their dreams to stay while they experience the trip of a lifetime. For more information on campsites in this region, contact LUX-camp today. Why Should Visitors Arrange a Camping Holiday in Dordogne? Dordogne is set in the southwest of France and is famous for its prehistoric villages. 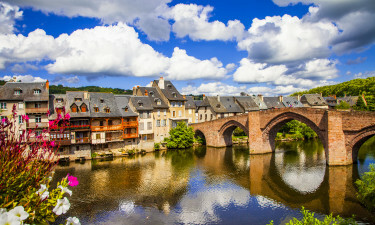 People who have an interest in history and culture will enjoy exploring these well preserved ancient settlements, while the more modern but still charming traditional stone villages of the area are set against picturesque backdrops and make great daytrip destinations while cycling or hiking through the surrounding countryside. Booking a mpbile home here is an excellent option for those who want to explore the lush surrounding valley. The luxury camping site also boasts its own swimming pool as well as a good range of other amenities and facilities for guests to make use of. Le Val d'Ussel is perfectly positioned for people of want to explore the picturesque Dordogne countryside and take a quick trip into Sarlat. The site itself boasts a large water park for guests of all ages to enjoy as well as tennis and volleyball courts. This charming site is situated on a bank of the river and water sports enthusiasts will love staying in a mobile home here. 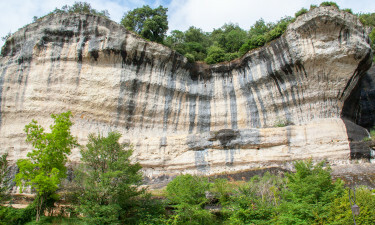 The pristine natural beauty of the area is reflected in the site’s large lawns and winding paths, while the town of Sarlat is just a short drive away. 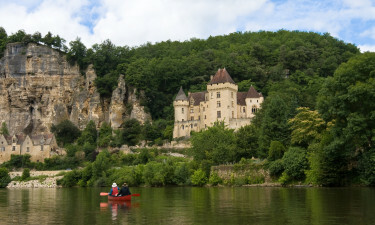 The enchanting Dordogne River flows through this area of France and offers visitors the chance to take part in a number of different types of water sports such as canoeing and kayaking. Fishing is also a popular pastime here, while visitors will have plenty of opportunities to explore many of the caves that have been formed close to the river. The area’s forests and gently rolling hills feature some excellent hiking trails as well as impressive viewpoints where visitors can soak up the scenery. Lovers of ancient architecture will be in their element as they explore Dordogne and the medieval fortress of Losse can be found at Perigord, while Perigueux is home to a number of impressive Roman remains. Visitors will want to make sure that they take a trip to the village of Beynac-et-Cazenac so that they can admire the Chateau de Beynac, which is the region’s most impressive castle.